I have the same problem. However, I use XP so the provided solution does not work. I also use XP (sp3). So the provided solution woold not work for me either. 4. Under "Sound Recording", hit the "Volume..." button. The "Recording Control" window should pop up. 5. In the Recording Control window, hit Options, then Properties in the menu bar. 6. Under "Show the following volume controls" make sure "Stereo Mix" is checked. 7. Close the Properties window, then make sure "Select" under "Stereo Mix" is checked. I'm fresh caught to CS 2.5. l'm still having troubles with the audio. The sad thing is that it worked for me when using CS 2.5 Beta on smaller clips but l upgraded to 2.5 and l seem to have lost audio. I'm running XP Home (sp3). I followed the instructions above from jmcruz12 (thank you), but to no avail. I've even gone back to the beta version - no audio. I admit, l'm confused.Any thoughts? I was able to follow the instructions until step 7; there is no "Select" under "Stereo Mix" in the Recording Control. FINALLY! I HAVE A SOLUTION! Unfortunately, this does not seem to work for me. The Stereo Mix was already checked and unmuted in the Realtek manager. Actually with this fix Stereo Mix will show up under the record options for microphone. The solution given by JmCruz12 worked for me. Thank you. When I record by mic I will find out if I have to reverse the decision. You solutions are on windows XP, I'm on windows 7. Plus, since I'm French, all of realtek settings are in French, so I'm completely lost in your explainations. "1. Enter the Reltek HD Audio Manager. 2. Click on the "Mixer" Tab." I was having the same problem with Win 7 so I had to do some digging. I did get it to work in the end so I will try to help you. The help for Win XP is close, but Win 7 looks a little different. One big difference for me is, there is no 'mixer' in my Realtek setup. I had to go through the Hardware -> Manage Audio Devices. In there, go to the 'recording' tab, select your microphone, and 'configure' it. Setting this up got it working for me instantly. I hope this helps you. I hope that Office Word 2007 translates this correctly! I do not speak French, but I will do what I can. I took a screenshot, but I do not see a way to post it. Sorry. To upload screenshot, you can upload on Imagilive and put here the link to the picture. I'm trying to do the same as you did, could you explain what you did exactly by "configuring it" ? How was Word's translation? Was it at least close? Here is a screen shot of how I got it to work. I'm using a USB microphone, and I'm on Vista. Go to the Control Panel, Sound. On the second tab, Recording, make your Microphone (USB) the default, and it worked for me. Thanks so much for the posts in this thread and in the "WaveoutGetSelectControl() failed" thread for giving me hints on how to troubleshoot. i use Realtek HD Audio , and i dont found it. Can anyone help me? Some computer companies like Dell have buckled under pressure from the RIAA to remove Stereo Mix from their machines to help stop people from bypassing their DRM efforts. If you have such a computer, you will have to get an attenuating patch cord from Radio Shack, going from the speaker or headphone out to the line or mic in. Be certain to have all your levels turned way down when you plug this in, and ease the levels up slowly and conservatively, testing until you find out what works. Hey guys, for those of you who are still having this problem, Terry and I may have a solution. I have similar problem. I'm using win XP x64 and recently downloaded the latest beta (2.6b) and tried to region record a ytube video with using the speaker sounds. It did the recording, and I heard the sound as it recorded, but at the end, when the flashing finished, I got an "audio failed" error message. So I tried it again, but didn't hear any sound and then the same error message. I thought maybe I needed to reboot after installing, so I uninstalled and rebooted, then installed and rebooted. Same problem. Then I found there was no sound to my speakers except when booting, the bios controlled "rebooting" message worked, meaning there wasn't a speaker connection problem. Long story, I used a previous restore from two days earlier and everything worked. I since repeated all this and had the same results. Even re-installing the Realtek AC97 drivers didn't help. Any idea what is causing the problem? CamStudio works otherwise? No, I guess I could try re-installing the vs-2008 runtimes, but then I might be breaking other applications. I'm pretty sure I have applications that use the 2008 runtimes and haven't seen a problem, but being a programmer myself, I know how that goes. I've not ever heard of the 2008 versions competing with the 2010 ones, that is, I've never heard of it breaking any other runtime dependent programs. If you find a reference, please do let me know about the instance! I have the same problem. Trouble is, though, I was just using it earlier yesterday morning with the same settings, and it did just fine. I have a WINDOWS 7 system, not XP, and I AM USING STEREO, not mic. Can someone help me? Why did it just crap out just now? Everything went fine until this happened.........and for no reason whatsoever! I touched nothing!! I take it you mean you have the same problem as jaf. And you are using the "Record from Microphone" choice, not the "Record from Speakers" one, which is temperamental? I have had this problem and I finally figured it out. Like others, I have a Windows 7 64-bit with the Realtek Audio for my sound. I had figured out long before to go to Control Panel under Sound and enable the Stereo Mix. 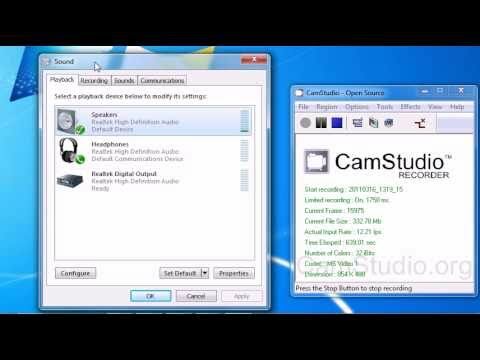 With that I was enabled to record the sound from my computer with some of my recording programs, but not with Camstudio. I have now found out that it is because of the quality of the sound settings in Realtek Audio Manager. To fix it, this is what I did. Go to your Realtek Audio Manager in the Control Panel and under the Speaker tab, select the default format tab. Change it to the first one on the list, 16 bits, 44100 Hz CD Quality. Do the same under the Stereo Mix tab (or whatever it is called in your setup). Now in Camstudio under Audio Options, set the recording format to be the same as in Realtek, which is the bottom one in the list. Make PCM your compressor. This fixed this problem for me. I may make a video tutorial of this later on. I am running a Toshiba Satellite with Windows 7 32 bit and had the same issue. I could not find the stereo mix option no matter what tricks I tried so I went to the Toshiba website and downloaded the latest BIOS and Realtek Audio drivers. As soon as I rebooted the stereo mix option was there and CamStudio has worked perfectly since. I would strongly suggest checking the Toshiba site for updates or the Realtek site or whatever your computer or sound card manufacturer is to make sure you have the latest drivers instead of allowing Windows update to leave you with something that does not work.